For the first two weeks of October, the attention, not only of the Jesuits but also of many people, was centred on the election of the new Superior General of the Jesuits. Now that Father Arturo Sosa has been elected, what will the Jesuits gathered for the General Congregation do for the next several weeks together at the General Curia? 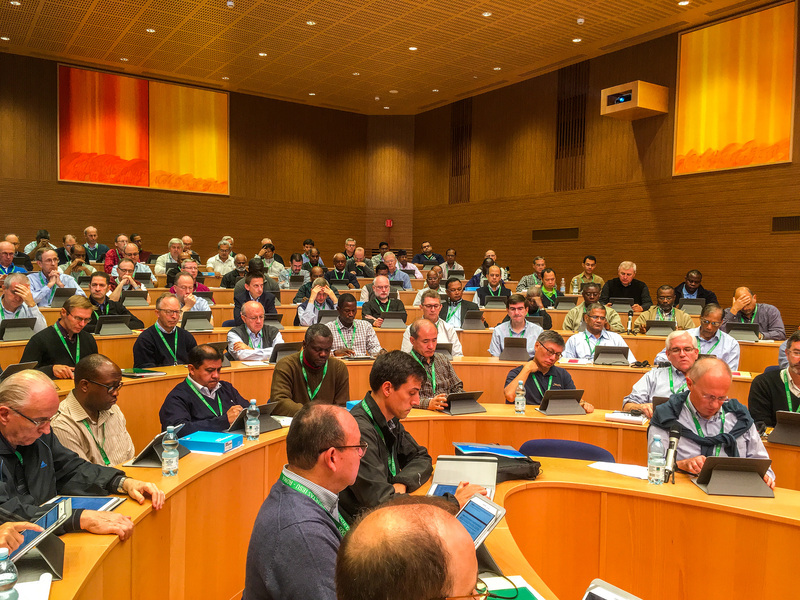 On Monday morning, October 17, the delegates gathered again in the Aula. The first to speak was the newly elected Father General; he underlined once again the legacy that his predecessor, Father Adolfo Nicolas, leaves behind. Fr Sosa remarked that Fr Nicolás had requested to absent himself from the work of the Congregation, so as to give it complete freedom: he added, of course they could count on his prayers. The outgoing General will enjoy a short break before starting his new ministry in the Philippines. Fr Sosa then sketched an overall picture of the work that remains to be done. The Secretary of the Congregation, Fr Orlando Torres, then outlined in more detail what the next stages of the Congregation will involve. One of the most important tasks of the Congregation is to provide the new General with “assistants”. In Jesuit jargon, they are spoken of as “assistants ad providentiam”, charged with the task of ensuring the good running of the Society, and of an ‘admonitor’, a close companion who mainly looks after the health of the Superior General, understanding the term ‘health’ in a broad sense. Following the recommendations of the Coordinating Committee, it was proposed to the Assembly to postpone the election of the assistants. We believe that it is preferable for this election to take place once the Congregation has fulfilled another important task: updating the governance structures of the Society at the universal level, in order to achieve the greatest possible apostolic effectiveness. Then, a member of the Commission on Governance, Fr. Mark Raper, presented the issues that have arisen in the preparatory works of the plenary assembly. Without going into detail on the content of those works or the different presentations, the Congregation is being asked to reflect and analyse the relationships between the General Curia, the Jesuit Provinces and the Conferences, with a view to better service. Fr Raper proposed to the delegates to take some time for personal reflection and schedule time for meetings by geographical groups (called “Assistencies”) in order to prepare possible decrees concerning the organisation of the central Governance of the Society. After presenting the contributions from these meetings, and taking into account the opinion of some experts, it is expected that in the following days decisions can be made on these issues. Once this is accomplished, the Congregation will be able to identify and elect the Assistants to work with Fr. General within the new governance structures.